No, you didn't read that wrong. 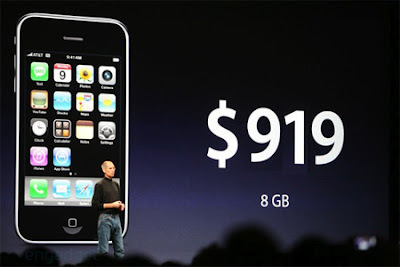 It seems to me that Steve Jobs transposed a couple of digits when he announced the iPhone 3G. Add a Consumer Data Plan for iPhone 3G to a qualified voice plan for $30 per month. Add an Enterprise Data Plan for iPhone 3G to a qualified voice plan for $45 per month. To me, this phrasing implies that I could also not add on a data plan. And nowhere on their web site do they say that data plans are not optional. But that's what they are -- according to sales representatives that I talked to at an AT&T corporate store, you must add on a data plan, even if you won't be using it. I think what's on their web site is borderline false advertising. $30 per month times the two year contract comes to an additional $720. Of course, it's even more after that. It mocks Steve Jobs statement that they're making it cheaper so more people can afford it. I'm about to get my daughter her first cell phone. She's not going to be using it much and she certainly has no need to browse the internet or get her email on it. But, she's carrying an iPod already and I thought I'd splurge and get her an iPhone so she could just carry one thing. I was thinking of a $199 splurge (and I actually delayed getting the phone to wait for the iPhone announcement), but I'm not about to go for a $919 splurge. Apple and AT&T don't force iPhone users to pay for music they don't want -- why do they force them to pay for data they don't want? I'm not stupid. I know the cost of the phone is being subsidized by AT&T. And I actually don't think the pricing is that bad if you do want the data plan. Maybe part of that subsidy is coming from profits on the data plan (though that would surprise me -- I would guess that the data plan itself is much less profitable than voice plans). If they need to charge more for the phone if you don't get a data plan, I've got no problem with that. Cell phone carriers already have different phone prices depending on the plan you choose. Just be up front about it and don't force me to pay (exorbitantly) for something I don't want. When my daughter thought that an iPhone was a possibility, she was pretty happy. Now, she's not very happy with me or Apple or AT&T. And, AT&T loses us as a potential customer for two years when we renew with T-Mobile.